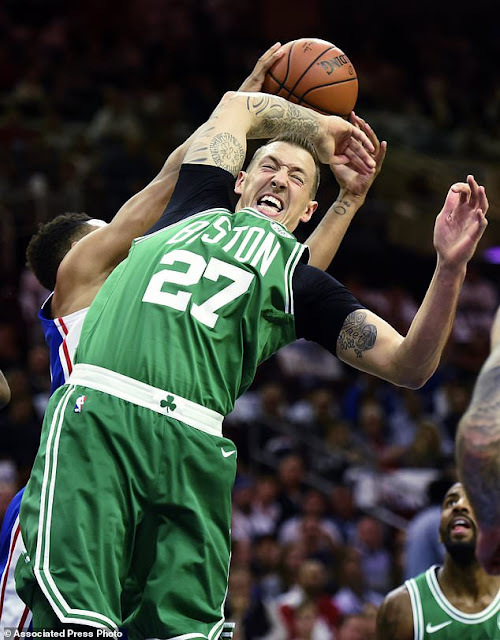 In the four Celts games so far, Daniel Theis' minutes have increased every game, from zero minutes in the first game to 21 minutes in the last one. His rebounds have gone from two in his debut to three for his second game and then to five in the last. He is also shooting .600 from the field and is averaging one block per game. In 21 minutes against New York, he had 11 points, five rebounds and two blocks. Too early to tell if Daniel will ever be a star in this League, but it certainly looks like he belongs and that he can play a significant role for Boston this season and beyond. He can shoot, rebound and block shots. He has youth (25 years old) and size (6'9"). In the finals last season, the Cleveland Cavaliers and Golden State Warriors were employing 8-10 man rotations. With Boston's depth, they would most likely do the same. Yes, we are talking playoffs and even a shot at getting to the Finals. A perfect scenario would be the young guys getting experience in the regular season and Gordon Hayward returning at 100% in time to get in game shape, but only if Gordon is truly ready. There is little doubt in my mind that Theis will be part of that playoff rotation. He has produced with the added minutes, and he is a natural rebounder and shot blocker who can shoot the ball. He is strong at the rim and plays bigger than his listed size. Daniel is definitely adjusting well to the NBA game, and should be seeing even more minutes in the near future.